Super mini and lightweight design with a refined look. 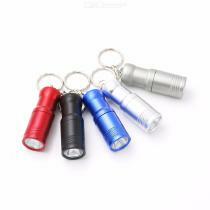 High power T6 LED flashlight and 3 switching modes: high, low and flash. The brightness of the light can be as high as 1600 lumens and the life span can reach 100,000 hours. Equipped with a key ring that is easy to carry around. A special reflector design increases light output efficiency. Suitable for all kinds of outdoor activities. Such as hunting, cycling, hiking, camping, etc.